November 12, 2015: Bloomberg Radio's Surveillance -- In a dynamic discussion with hosts Tom Keene and Barry Ritholz, and fellow guest David Kotok of Cumberland Advisors, Louise covers prospects for the price of gold and also current cyclical and structural aspects of the equity markets. Audio of the program is available from Bloomberg in MP3 format (Louise's discussion runs from 23:14 to 27:35, and from 34:25 to 41:58). "Still, markets rallied, no doubt boosted by renewed expectations that a Fed rate hike is a 2016 event, even as central-bank officials and many economists cling to the idea that liftoff could take place before year end. Regardless of the outlook for monetary policy, clients of Louise Yamada Advisors were tipped off last weekend about what to expect in her monthly report titled, 'Bear Market in Progress; Rally at Hand?' [published October 3, 2015]. "While Louise contends that the highs of the six-year bull market have been seen, bear markets usually feature rallies. Even without speculation about the Fed's deferring liftoff, she spied trends in the market that pointed to bounces in deeply depressed materials and energy stocks ahead of last week's rebound. As for the latter, the Energy Select Sector SPDR exchange-traded fund (ticker: XLE) jumped 8% last week. "The move could take the S&P 500 to the 2050 to 2060 range and the Dow Jones industrials to 17,500 - from Friday closes of 2014 and 17,084, respectively - but long-term sell signals remain in place. In her monthly missive, Louise writes that the risk is for a retracement to the levels where the major averages broke out from their long-term trading ranges in 2013. 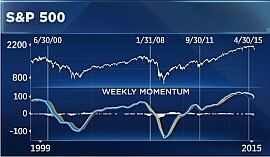 In round numbers, that would be back to 14,000 on the DJIA and 1600 on the S&P 500. "Good advice, as the market provides higher prices for losers, which are tax-loss candidates, and winners, as well." October 7, 2015: On Bloomberg TV's new market-wrap show What'd You Miss? Louise is interviewed by hosts Alix Steel, Joe Weisenthal and Scarlett Fu regarding the monthly technical charts of leading market indexes. Video is available from Bloomberg. September 2, 2015: In a Bloomberg News article, reporter Michael Regan presents selected charts Louise discussed in her interview yesterday with Tom Keene of Bloomberg Radio. Regan includes quotes from the interview. Text of the article, including charts, is available from Bloomberg. Bloomberg Terminal users can read the article with: TOP <GO> and enter "Louise Yamada" in the search box. September 1, 2015: On CNBC TVs Futures Now show Louise is interviewed by host Jackie DeAngelis about recent volatility in the stock market. Video and text are available from CNBC. 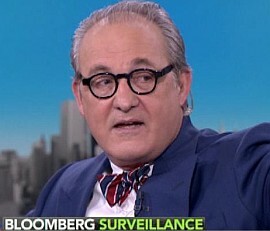 September 1, 2015: Louise is interviewed by host Tom Keene on the Bloomberg Radio program Surveillance, discussing recent market volatility and her approach to technical analysis. Audio of the interview is available from Bloomberg in MP3 format (Louise's discussion runs from 2:33 to 10:55 and from 14:52 to 19:58). Last Updated: March 12, 2017 12 AM Copyright 2005-2019. All Rights Reserved.